Hawker style asian fusion in a rustic setting. Doesn’t look fancy off Liverpool street, but the fancy food :). We booked for the 12PM session and were asked to conclude our lunch by 1.30PM. Unfortunately we were late, so the waiter had reminded us that they were fully booked for the day and would still need to conclude by 1.30PM. The two of us arrived first then the rest of the party by 12PM, we were quick to order our beverages and chose the feed option – $59 per couple for 5 dishes each. Ordered 3 flavours of the mocktails they were refreshing but the best is Cranberry, Mango then Lychee crush. Cranberry had coriander in it, for someone who doesn’t like coriander – couldn’t even taste it! Win. I can only review on the dishes I tasted, C & W ordered BBQ Balinese Prawns Sate that I didn’t try. But they enjoyed it. It meets their experience of Bali style lemongrass and prawn. 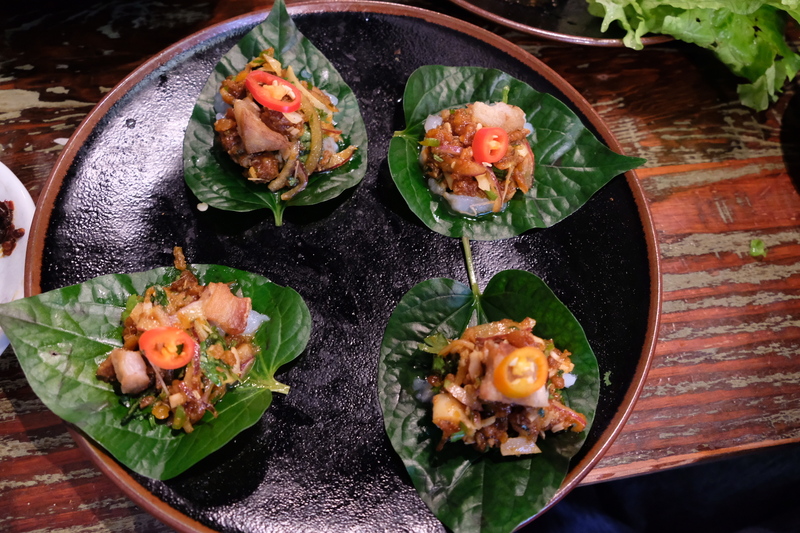 I had the chance to taste the Prawn Dumpling, Crying Tiger, Lamb Ribs, Betel Leaf, Pork Neck and Pork Belly. This Crying Tiger is char-grilled wagyu beef with a spicy citrus dipping sauce. The wagyu beef is tender and the dipping sauce is SPICY! Watch out when RPS says spicy! For those who can’t take it, make sure you ask for an alternative. Prawn Dumpling was good but a little surprised that it had a grainy texture rather than a bitesized prawns wrapped inside the wonton. Grainy makes it feel borderline mushy and not wonton per say. Sauce is again spicy! BBQ Lamb Ribs: mekhong whiskey marinated lamb ribs in a sticky special sauce. That sticky special sauce is yummy! Lots of coriander too! Thankfully we can just take them out. The sauce is so juicy that you can keep eating more. The flavour of the stick sauce overtakes the lamb gamey scent in a good way… It was very easy and not messy to eat. Ordered Roti separately to share. But it was very crisp, I’m use to the Roti’s that is a bit more oily to tear apart. This roti is also claims to be “malaysian” but when teared apart bits and pieces fall everywhere on the plate. In saying this, it had a beautiful peanut dipping sauce to accompany the slightly dried carb. I didn’t think we needed to add this on top of the 5 dishes of set lunch. Betel leaf wrapped itself with raw morton bay bugs. This was the best looking dish however when picking it up and biting a mouthful of it through the crunchy and fresh Betel leaf. I couldn’t taste the morton bay bug’s flesh – no seasoning on the protein but lots of little flavours on top of the protein – a hint of spicy caramel sauce. Filipino BBQ Pork Neck was next, marinated in a spicy cola sauce. served with lettuce cups and pickled green papaya. I could keep eating this because of the sauce and the size of the pork. This was the second last dish with double the portion because we all ordered this as one of the five selections of the lunch feed option. Last dish was the pork belly with double the portion – again we all ordered this so the kitchen made it to one plate. Pork Belly had a lot of fat, twice cooked pork in a tamarind caramel sauce topped with a fragrant herb salad. The crunch was from the bean shoots, but I was looking for the crackle :(… It wasn’t there. It was still a good dish. The boys finished the dish while I continued on the BBQ pork neck :). Service kicked off well they were quick and friendly to guide us on how it all works at this joint. Service slowed down at our last two dishes, it came only at 1:20PM, whilst we were trying to finish it off and give the table back by 1:30PM as agreed, one waiter came to remind us as a courtesy. Nice for reminding us, but he had to knock on the table twice to tell us “Chop-chop”, it was absolutely unnecessary. They should know that the last two dishes took a long time – everything else was devoured and we were waiting for the last two dishes for 10 minutes whilst chatting. That moment we didn’t find it professional. In the end, we returned the table by 1:33PM (as per invoice). 3 minutes over – big deal. We left disappointed. Overall, we all had a great time catching up on the double date. I believe Rice Paper Scissors excels in their sauces and knows how to accompany sauce with the right protein. They also make their protein cooked perfectly. But suggest they work on the one-off waiter’s attitude.